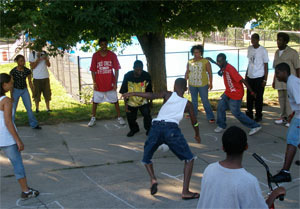 Remember playground 4 Square? Equal parts polite and cut-throat, simple and complex? We've scaled it up, waaaaay up! Come try a spiraled 9 Square, 16 Square with 2 balls, Giant-4-Square with paddles, maybe even 25 Square! This is Foursquare meets Jack and the Beanstalk! Come join us and test the limits of this timeless game. All ages welcome. Founded in January 2005, the Design Studio for Social Intervention (DS4SI) is dedicated to changing how social change is imagined, developed and deployed here in the United States. DS4SI is a space for artists, activists, academics and other social interventionists to reframe, re-imagine, and reinvigorate the possibilities of social change. We borrow methodologies from design practices and implement them in unconventional and innovative ways. DS4SI brings together urban designers, cultural architects, community activists, game designers, performance artists, and youth organizers to translate design theory into public interventions through youth and community engagement. Our work has been greatly inspired by game design, and we have used games as actual interventions, as metaphors to help organizers think about systems, and as a way to shift social activism into using more of a game design approach in terms of using spectacle, delight and the magic circle when they design campaigns, actions and interventions. Square Root was first played in Dudley Square, a busy bus station in Roxbury, MA. The founders and game designers at DS4SI are Kenneth Bailey and Lori Lobenstine.